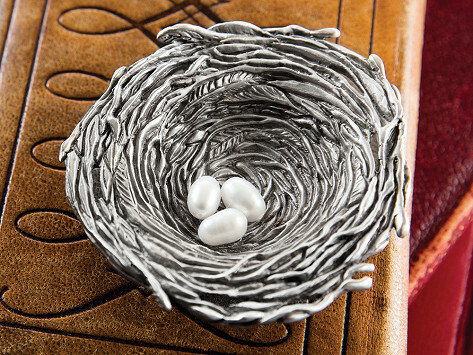 This Made in the USA pewter bird's nest serves as both a beautiful ornament to display, and as a resting spot for sundries. Customize a nest by choosing the number of pearly eggs to represent children, grandchildren, or other family members. Bought this for my daughter's birthday, and to honor her two children. The nest and eggs are very pretty. Cynthia Webb was an architect before following her heart into designing pewter wall art and ornaments. All her work, including her signature bird’s nests, is handmade in her San Diego studio. She starts with design sketches that are then carved into wax to create molds for the pewter. Cynthia began making ornaments, which are a small and sweet touch. She has since expanded to include larger pieces, like her framed artwork and bird’s nests. Her hands-on approach extends to the finishing of the pewter, and the signed wall art as well. 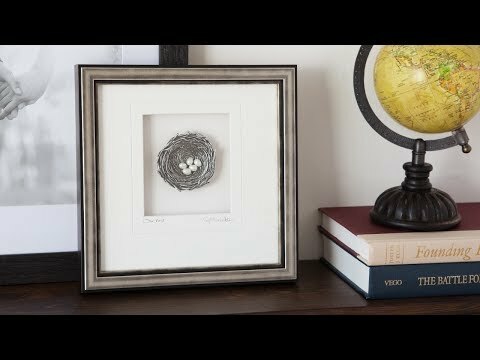 The nests make for a perfectly lovely (and customizable) gift, but you can’t go wrong with any of her work that pairs loving sentiment with careful craftsmanship.